This week, between major holiday eps, the series pauses a moment to reflect and take stock of a few dropped / neglected story-lines -- and the result is my new favorite episode of s.3 so far. It all starts with Jimmy and Maya congratulating themselves on putting up the Christmas tree early for once while they have Kenneth take the family photo (meaning he'll have to be Photoshopped in afterwards). JJ calls out his parents for not being as "together" as they think, as they still haven't finished the garage "man-cave" they had given him for his 18th birthday (s2e14 "E-I-- Eighteen"), in turn prompting Jimmy to remind Ray of the disabled-accessible inclusive-playground charity idea (s2e3 "J-J's D-R-- Dream") he had quickly abandoned, which causes Ray to accuse Dylan of never having honored any of the Christmas coupons (for hugs, chores, favors, etc.) she had made him over the past decade or so, and Dylan brings it full-circle by chiding JJ for still not preparing for college despite having been given an extra year of high school to do so (s2e13 "D-I-- DiMeo A-C-- Academy"). 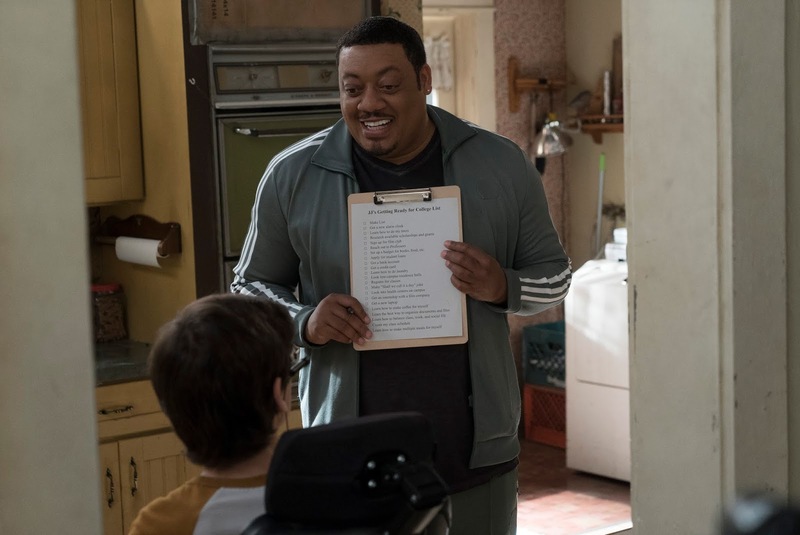 Kenneth goes over JJ's college-prep to-do list and decides to let him tackle learning to make coffee first (something he'll need to start every day, if he's anything like me!). Encouraged to do more things on his own because his aide won't always be there for him, JJ tries to pick up a glass carafe but drops it and then punctures his power-chair tires on the broken pieces; a plan to get some tire-sealant from a neighbor goes nowhere, and he tries to go online to find a wheelchair-repair service only to discover the Wi-Fi is down. Still, when Kenneth suggests he give up for the day, JJ refuses, even if it means lurching out of his chair onto a pile of clothes to go about the process of plugging in the router (inexplicably set up under the kitchen sink). While "L-O-N-- London (Part 2)" found JJ wondering whether Kenneth will still want to be friends with him no matter where life after high school takes them, this ep deals head-on with the question of Kenneth's future (since at least JJ has college and possibly film-industry work to aim for). Kenneth's breakdown over still not having figured out his own plans or what he'll do without JJ was gut-wrenching, but JJ's inspiring speech to him (taken from the movie Taken) was great, and I liked the suggestion of Kenneth possibly becoming a coach. Meanwhile, Ray gives Dylan a chance to honor her "Do something sweet for Ray" coupon by having her accompany him to City Hall, where he is directed to various offices and fills out form after form to secure a location for his playground; however, his permit is ultimately denied by the Assistant Zoning Commissioner ("My sister uses this area to play Frolf"). After seeing her brother in a deep funk over his inability to make JJ's Dream happen despite having followed all the proper procedures, Dylan later surprises him with the secured location; though she had actually just raised hell at the "permit place" to get the approval, she decides it's more important to restore Ray's shattered worldview by letting him think the snag was simply a "misplaced form" on the office's part and he deserves full credit for following the rules. As excessive as her picking on Ray can seem -- though I think he does bring it on himself sometimes, in his self-serving / pretentious / whiny moments -- I always find it refreshing to see Dylan acknowledge and respect his more positive attributes. Musical Moments: In the closing tag, when Maya surprises Jimmy with a picnic on the beach, he surprises her by singing the now-finished song that he had partially written for her back in 1997 after they had first met; in a nice call-back to the reveal in s1e14 "V-A-L-- Valentine's D-A-- Day" that they had fallen in love while she had still been engaged to his then-roomie, the catchy little ditty goes, "Hey roommate, can you spare a wife?" Also, as Ray navigates local-government bureaucracy, he has Dylan psych him up by singing the Rocky theme... which she doesn't really know, so she makes up a similarly inspiring tune. Fun Fact: Micah Fowler (JJ) and Mason Cook (Ray) are celebrity ambassadors for the real-life inclusive-playground charity Shane's Inspiration. Next Week: A little lie about a Christmas disaster spins out of control, and Kenneth must deal with his sisters in "J-I-- JINGLE T-H-- THON." Grade: 10/10. Possibly one of the sweetest episodes yet; it pretty much encapsulated everything I love about this show and every one these characters.